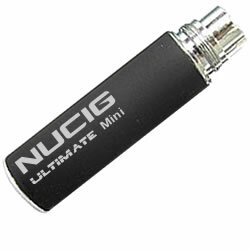 Electric cigarette mini ultimate battery. Buy UK NUCIG. Lasts for 3 hours continuous use. Customer support fantastic, love your products you just need to have more sales. Bought this product for my wife as she was fed up with the batteries I was buying her. She thinks they are fantastic. This is the best electric cigarette I've used so far, it's a nice size and fits into a pocket easily.